I have a wacky allergy to corn silk, but it doesn’t keep me from tucking into corn on the cob in the summertime. We always had ears of sweet, white corn boiled to perfection and perked up by sugar, salt and creamy butter. But a while back, when I was introduced to the joys of grilling corn instead of boiling it, I was an instant convert. No need to steam up the house and the added loveliness of smoky char with the sweet corn goodness. It was brilliant through and through. On days that I’m not thinking ahead to grilling corn for the evening, I have my trick of getting around the usual 30 minutes of soaking in salt water and another 25 minutes grilling the corn. I’ve got into the habit of microwaving the corn in the husk to pre-steam it before grilling, cutting the entire cooking time down to a meager 20 minutes tops. You top the whole thing off with a delicious compound butter made of fresh basil, chives and parsley. It’s one of those tricks for the arsenal when a bland barbecue chicken breast or ho hum hot dog is in your grilling future. This life is too short to be bored with boiled corn. Begin by making your herb butter. Put the salt, paprika, black pepper, basil and parsley in the food processor. Chop finely and then add the butter and chives. Blend to combine and then scrape out of the food processor with a spatula. Chill. Carefully pull back the husks, leaving the ends still attached. Remove the silk and discard. Put the husks back over the corn. Place a wet paper towel in the microwave and top with two ears of corn. Microwave for 2 minutes, turn over, and cook for another two minutes. Set aside. Repeat with the other ears of corn. Heat your grill on high and place the ears of corn on top. 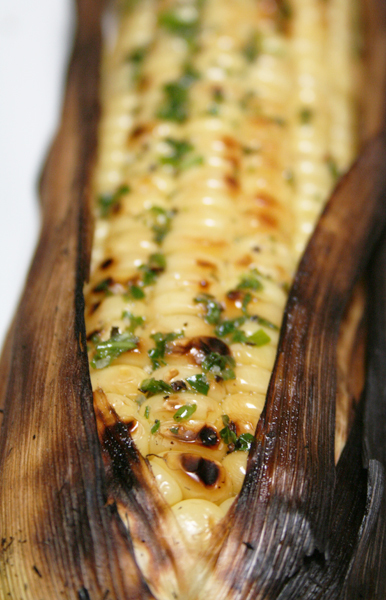 Grill for about 6-7 minutes per side, or until the husks char and the corn gets some gorgeous grill marks. Let cool for a moment and then pull back the husks. Slather the ears of corn with the herb butter and serve.